Ex-president of Nigeria, Chief Olusegun Obasanjo, has advised President Muhammadu Buhari to start his anti-corruption fight with himself, the vice president, the Senate President and the Speaker of the House of Representatives, before extending same to other Nigerians. The former President who described corruption as a ‘hydra-headed monster’ that must not be allowed to live, said the fight against the monster must begin from the top. 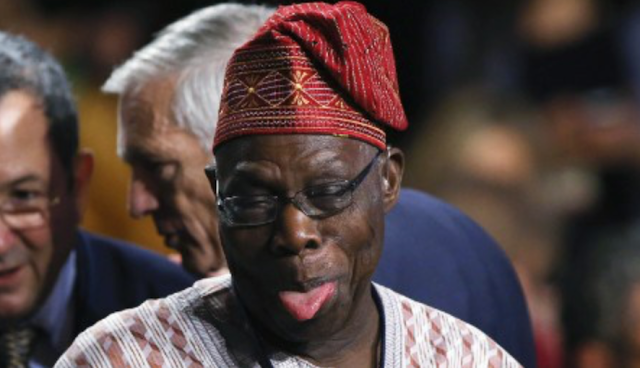 Obasanjo, responding to a question from a student on his view about the administration of President Muhammadu Buhari, however, said the president had left no one in doubt that he was willing to battle corruption. “The president promised he will fight corruption. And there is no doubt that he has shown that he is willing to fight corruption. Corruption is a hydra-headed monster. As the former President mentioned the Chief Justice of the Nation, one of the participants, who was later joined by others, asked him to include himself and other former presidents in the list of those to be tried for graft. In his reaction, he said: “Did I hear somebody say and you? Oh, you mean and former presidents? Former presidents have either done their bit when they were in office or they did not. “The instruments we are using today (to fight corruption) were all fashioned out by me when I was in office. We did not have anything like the instruments (ICPC, EFCC) before. Not only did I bring up these instruments, I also looked for the right people who could make the instruments work. “Nuhu Ribadu was in charge of the EFCC and then, the fear of Ribadu was the beginning of wisdom. For ICPC, I specially head-hunted somebody like Justice Mustapha Akanbi to run it,” he said.